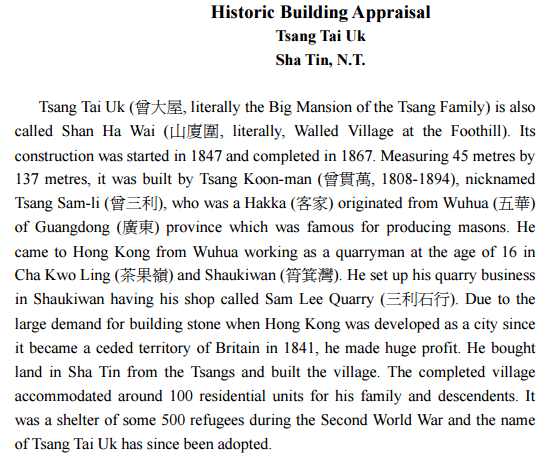 HF: This Antiquities and Monuments Office (AMO) Appraisal mentions that Tsang Koon-man (曾貫萬, 1808-1894), nicknamed Tsang Sam-li (曾三利) came to Hong Kong and “set up his quarry business in Shaukiwan having his shop called Sam Lee Quarry (三利石行)”. Does this mean the quarry was called Sam Lee? The shop [?] was called Sam Lee, and what did it sell? Or both? Or neither? Translation of 三利石行 would be very useful. Ho Yin: Did Sam Lee refer to the name of the quarry (where Mr Tsang excavated the granite) or the shop (where he made deals with the buyers)? I think that Sam Lee is the name of the shop Tsang operated, rather than the name of the quarry. Tsang might excavate his goods (granite) from one quarry, or he might excavate it from more than one quarry (I’m not sure). However the goods were sold from his shop which was called Sam Lee.